Few places on earth hold as many mysteries as the ocean. Much of our understanding about the history of the deep ocean comes from studying fossils like the ammonite and the rocks where they rest. The ammonite was a warm sea mollusk creature that lived between 200 to 140 million years ago, during the Jurassic Period. Their soft protruding bodies resembled the modern-day octopus or squid with a hard-coiled shell (like the nautilus) that would make up half its total length. Paleontologists believe the ammonite spent most of their life in shallow waters. The thin plating that sealed their 26 chamber walls were made of mantle tissue, allowing the soft body to retract for protection. This structure made it unlikely for the shell to sustain the high pressures of the deep sea. When some people think of fossils, the first image that comes to mind is the tall skeleton of a tyrannosaurus rex. While all fossils are the remnants of an organism like bones, shells, and leaves, this includes remnants of activities like burrows and footprints. Ammonites are more likely to create a fossil because of their hard shell. After the decomposition process, the shell is buried under sediment where chemical alteration or replacement and compaction occur. These shells have been found to survive tens of millions of years without damage. Skeletons and shells containing calcium carbonate are replaced with calcite or aragonite to preserve its newfound shape. However, aragonite is unstable and more likely will dissolve away overtime than calcite, leaving behind a mold of the fossil. 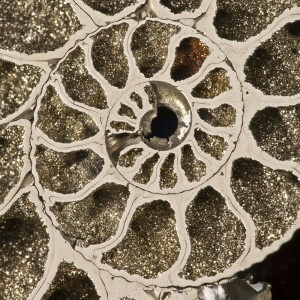 The empty molds that are left behind are likely to take in new minerals like silica or pyrite, creating intricate ammonite-shaped mineral pieces. 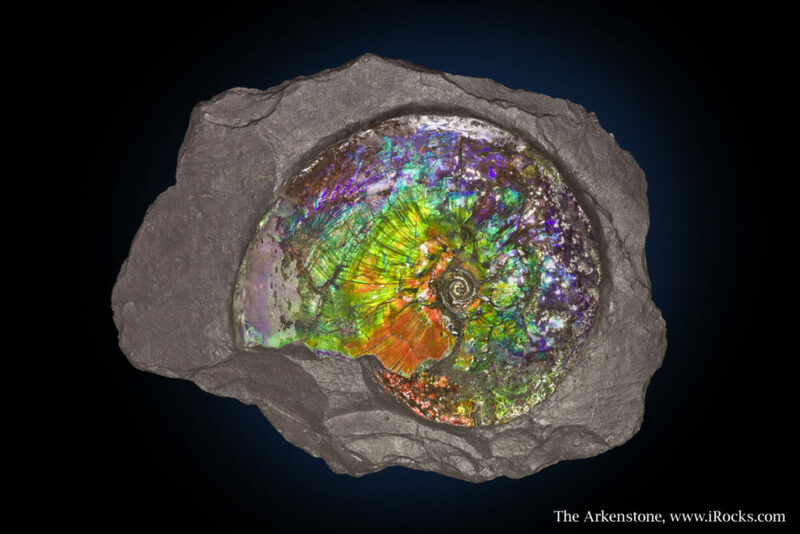 Ammonites found in Canada can have a unique iridescent, colorful appearance that is often used in the creation of ammolite jewelry. In rare instances, an ammonite is opalized by minerals coating and replacing the organic material through the veins of sedimentary rocks. Opalized specimens shine the same colors as an opal with flares of red, yellow, green, and blue. These ammonites were given the name “ammolite” in 1981 by the World Jewelry Confederation. There have been famous instances in history where the discovery of ammolite specimens would spur legends of dragons and serpents. In the Middle Ages, ammolites were thought to be “draconites” – a mythical gemstones from the head of dragons. In 7th century Ireland, ammolites were thought to be the “snakestones” cast away by St. Patrick. Ammonite fossils give collectors a glimpse into an ancient earth where the climate was warmer and ocean front were full of life. The ammonites were quick in adapting to their environment, allowing a variety of shell shapes and sizes. Some ammonites like the parapuzosia seppenradensis grew to a diameter of 11 feet, making them a fearsome creature of the ancient sea. Interested in adding an ammonite to your collection? Follow the Arkenstone on their many mineral shows throughout the year! Information on the shows we’ll be attending can be found on our Mineral Shows page. We’d love to meet with you and talk about the specimens in our collections! Also, we’ve recently updated our galleries with many impressive specimens from around the world. You can find our latest collections here.